You are browsing the 1983 folder. For the purposes of this article, I use a definition of “1.0” given by Eric Rasmussen on his site Apple Macintosh before System 7: anything produced before January 1984. Eric maintains a table of early system releases organized by release date, which is the most sensible way to do so given the confusion of version numbers. As he notes, what was shipped in January as 1.0 actually had an internal version number of 0.97. I nevertheless treat this software as the 1.0 it was presented as. In addition, the January Guided Tour disk (Part# 690-5002A) contained what Rasmussen terms an “early version of the Finder.” This software actually does deserve to be treated as “pre-1.0,” see the separate article about this disk for more details. With all the ambiguity about version numbers and releases, what’s really the point of talking about pre-1.0 System Software releases? One answer is that it was precisely these early releases which journalists and authors used to cover Apple’s new system. 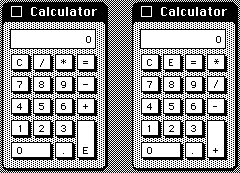 In an era when lead time was measured in months, not minutes, volumes such as Cary Lu’s The Mac Book as well as the inaugural issue of Macworld were based on much earlier software than what shipped in January 1984. Looking at these first sources can sometimes be confusing, because enough had changed in the time from when they were written to the Mac’s eventual release that there were substantial differences in look and feel. These differences are chronicled below. We put the Alternate Disk in at the last minute because Steve [Jobs] thought that the copy process as designed was convoluted and counter-intuitive. Understanding Jobs’ objection requires making clear a substantial difference between 1.0 releases of the Finder and later versions: the interplay between ejecting a disk and the trash can. Though many users of the circa-System 6 Finder know that dragging a disk to the trash ejects it, this is actually a legacy of the same complicated interface paradigm as the abandoned “Alternate Disk” shown above. Originally, the only way to eject a disk was to pull down a menu and choose “Eject”. A second disk could then be inserted, and files copied between the new disk and the old phantom one. If the user decided they were done with one of the two disks, they threw the phantom icon into the trash to indicate they no longer needed the virtual representation of the disk anymore. Around version (to come) of the Finder, this process was simplified: now, if the user wanted to eject a disk and was certain they would no longer need it in a file copying context, they could drag the full icon of the unejected disk into the trash. This would simultaneously physically eject the disk, as well as remove the grayed-out icon from the desktop. For obvious reasons, this change in behavior only made sense in a world where two floppy drives, or a hard disk, was the norm. This would not be true for several years after the Mac’s introduction. In this post-1986 context, ejecting a disk and simultaneously getting rid of the icon made a lot more sense. 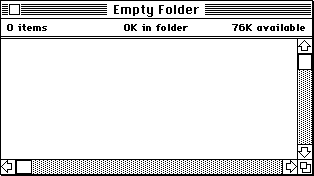 But in a 1984 world where (most) Macs only had one floppy, the system would necessarily need to keep track of the very floppy it had just ejected — the user’s system disk! This helps explain Hertzfeld’s ideaof an ever-present “Alternate Disk” as a way of allaying Jobs’ concerns about file copying. The icon was an ever-present reminder that the system could copy files to another disk. Though abandoned because of bugs and the possibility of user confusion, the idea of a virtual, grayed-out icon for a temporarily-removed disk lived on, in the image left behind on the Desktop after ejection. And the action of dragging an item to the trash to remove it — be that a disk, CD-ROM, FireWire hard drive or USB key — lives on as the descendent of a long-ago shortcut for ejecting a disk without the need to copy files to or from it. This is actually a lot more disturbing than you might think, if you’re used to the notion that getting all the icons visible at once is rewarded with deactivated scrollbars. Folder icons were more rounded, and were centered in the available space, rather than aligned to the bottom of the icon area.